The other day Cutie Pie wanted to help with breakfast. He loves honey on his toast…and didn’t need any help figuring out how to get it there! Once again it was a beautiful week! We spent a lot of time outside in our driveway riding trikes and bikes and kicking the ball around! We also spent some time in the sandbox and on the swing set as our backyard has finally started to dry out! It’s amazing what a few sunny, warm days can do! The driveway this week was covered with the usual bike ‘roads’ and train tracks to follow, along with a hopscotch layout, some numbers and letters, and some chalk paintings! However, we also tried our hand at tracing shadows with chalk, something we tried when Cutie Pie was younger, but which didn’t work because he wouldn’t stand still long enough, and seen just recently on Tinker Lab! This time we used our chalk to trace shadows of inanimate objects as well as people! The boys got such a kick out of this, even though it was something rather simple, that I found myself on the driveway drawing quite often and Cutie Pie gave it a try too! (coordination, fine motor) couple of times I traced the shadow of a toy when the boys were occupied with something else and they loved trying to guess what the object was that I traced! 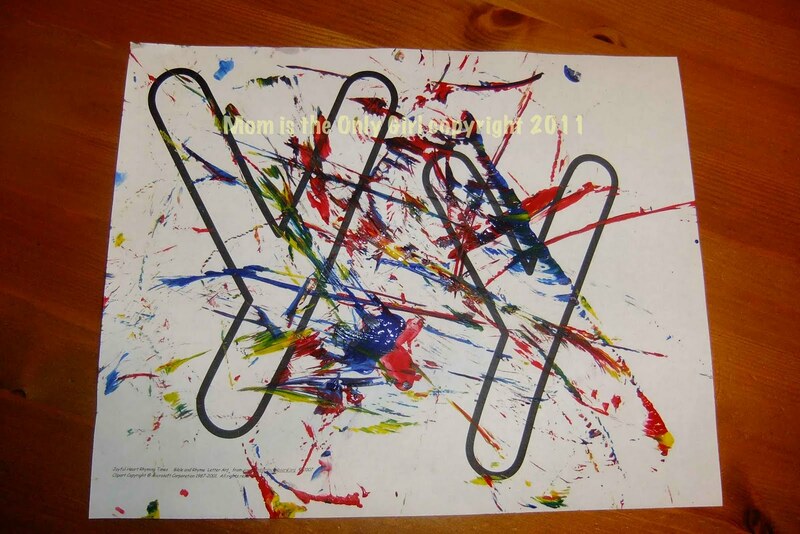 (abstract thinking) It made for a fun game! We also used this shadow tracing as a science lesson talking about why shadows move. When they noticed the shadows changed shape, even though the item whose shadow was traced was not moved, I asked how they thought it happened. Cutie Pie really thought about it before answering. I don’t remember what he answered, but I do remember I giggled before talking about how the sun moves across the sky (the easy answer for Sweet Pea) and how it is really the earth moving around the sun. Cutie Pie remembered playing with flashlights making shadows and how the shadow of an object changed when the flashlight moved. He seemed to quickly understand the basic idea of the earth moving making the sun moving lower in the sky, thus the shadows got longer, simple answer! 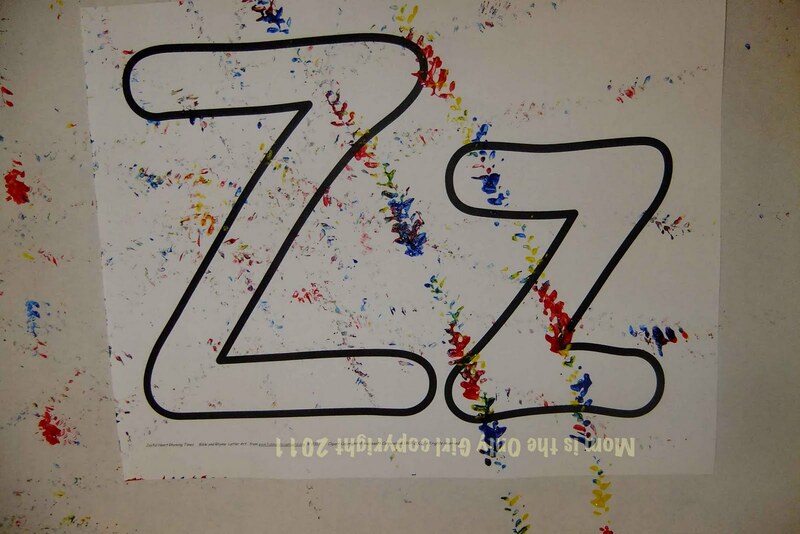 Try chalk shadow tracing and see what your kiddos think! 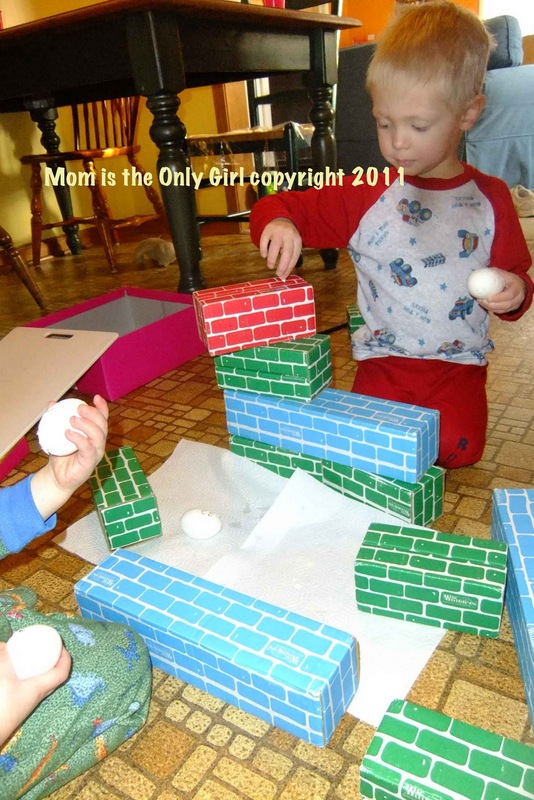 For more play ideas check out We Play at Childhood 101! Week in review letter H – Repost with Pics! We were having problems with our computer, so I wasn’t able to post pics for our letter H week and since everyone has been sick with colds and things have been on hold a bit I decided to repost this one and add in the pics! 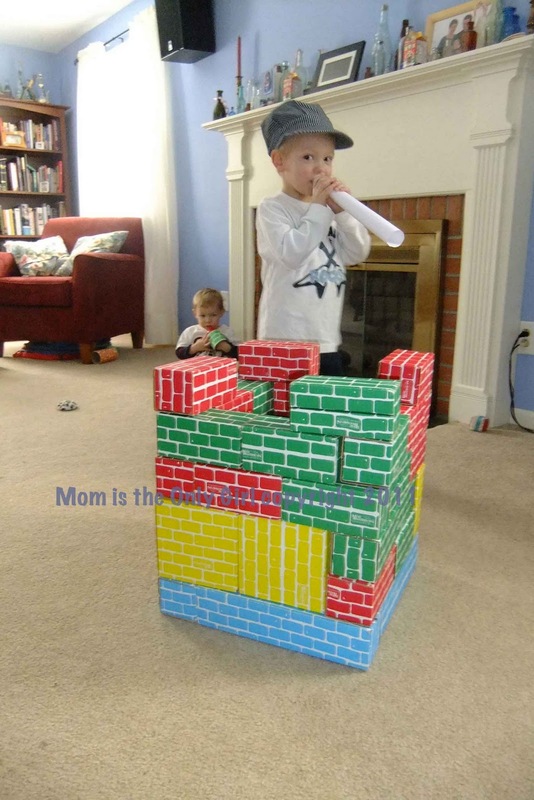 I don’t really consider this cheating for We Play because we actually did the Joshua and the wall again last week when we were building with bricks! We started out just reading the Bible story, then we also read Humpty Dumpty , as suggested in the Hubbard’s Cupboard 3’s curriculum. Cutie Pie remembered we had seen Veggie Tales Josh and the Big Wall , so it was pretty easy for him to understand the Bible story, so we talked mostly about the nursery rhyme and words that start with H: Hats, Hot cocoa, Heart, Hand, Heat, Hot, Hamburger, Hadrosaur, High, Horses, Help…and we did several experiments! Blowing his horn walking around 7 times! He had so much fun knocking it down! 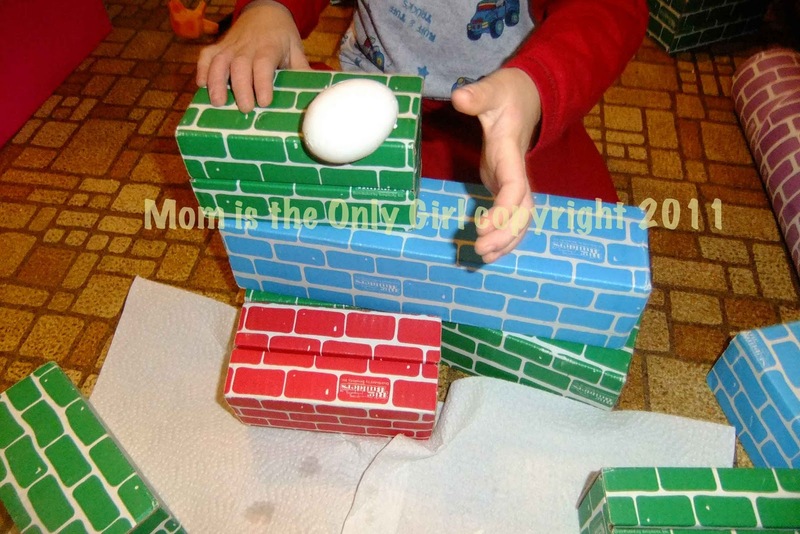 Throughout the week we built walls out of cardboard bricks and wood blocks and marched around them before blowing homemade Horns and knocking them down, and we let Hard boiled eggs fall from a (cardboard) brick wall that we built and talked about why they broke, followed by rolling a few down an incline. 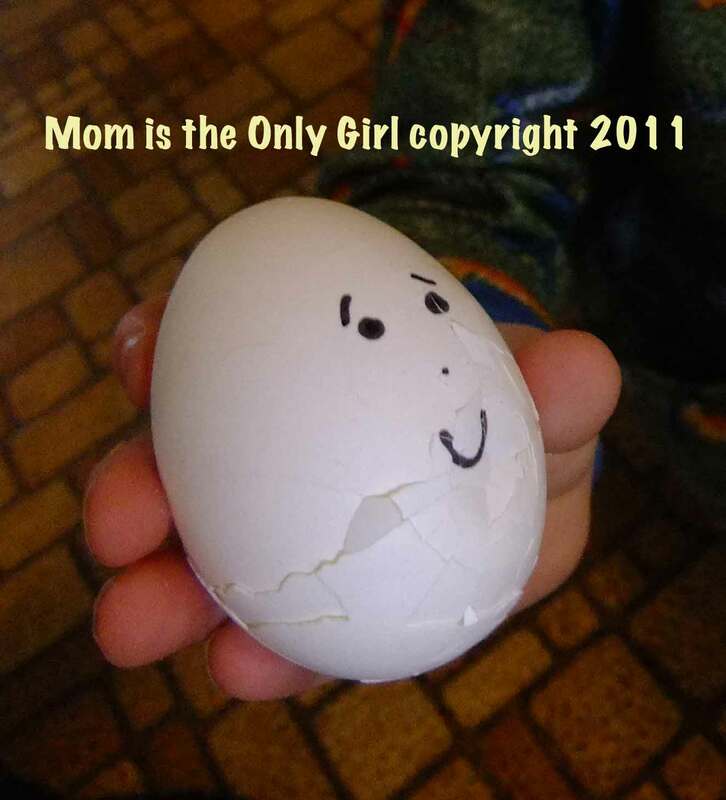 Cutie Pie’s hypothesis was that the egg would break, however, the experiment revealed the eggs stayed intact when they rolled! (science, gross motor) This lead to a discussion about what would have happened to Humpty Dumpty if he had a slide next to him to help him get down from the wall. We ended the week with two hot/cold science experiments, which I found in the book 365 More Simple Science Experiments with everyday materials , published by Black Dog and Leventhal Publishers. The first, called The Warm and Cold of It, uses Hot and cold water in 2 separate cups and two balloons filled with cold water, only big enough to hold water but still fit into the cups. “The balloon filled with cold water sinks to the bottom of the warm water, but floats to the top of the cold water!” It shows that cold water is heavier than warm water. The second hot/cold water experiment was called Color Me Warm, in which you have 2 glasses, one each of hot and cold water. You add the same amount of food coloring to both glasses. The food coloring in the hot water swirls and colors the water fairly quickly as opposed to that in the cold water. The hot water is in motion. As the water cools at the surface, it sinks to the bottom of the cup allowing more hot water to rise, which causes the food coloring to swirl! With each experiment the boys ‘tested’ the water to see which cup held which temperature and Cutie Pie came up with a hypothesis before we tested his theory (science, sense of touch). He loved this! Cutie Pie was pretty entertained by the inclined plane, so we found ourselves experimenting with that off and on all week assisted by some experiments. Cutie Pie told me the other day that he likes doing experiments with me and wishes he could do them every day. Since his interest is so strong I think I’m going to try hard to do this with him! 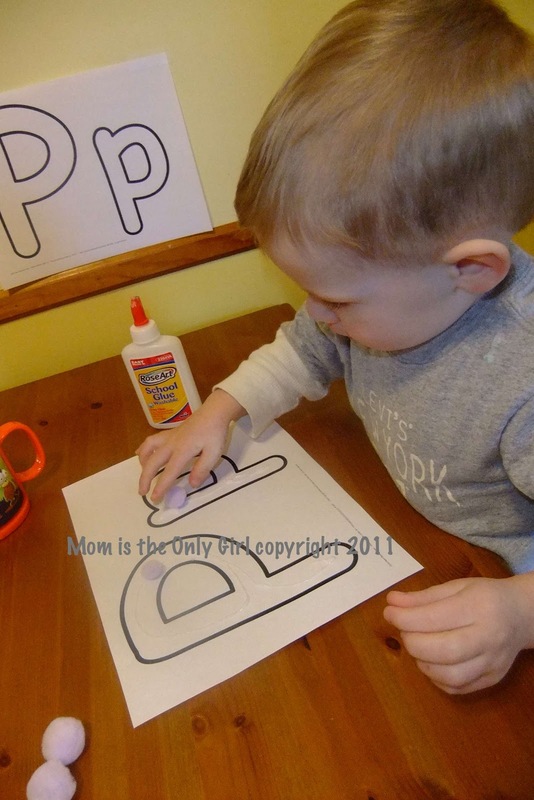 We didn’t concentrate much on the actual letter H, trying to write it or color it or anything since Cutie Pie announced to me several days ago now that he doesn’t want to learn his letters anymore. I figured I’d take it easy in that regard and follow his lead rather than push it and have him rebel, however, he has been picking up his Leap Frog Scribble and Write more often and asking for help with it less often, and he’s expressed several times that he wants to read! I think it’s just a matter of time. Rhinoceros. Race. Railroad. Ring. Rope. Round. Rip. Rat. Rich. Rainbow. Reading. Relatives. Rain (it rained a lot this week!) Raisins (our chosen snack for the week!) Right (Cutie Pie graduated to a booster with a seat belt and kept having to make his Right arm be in the correct spot) Rub. Run. Rocket. Robot. Red. Roll. Rest. Rock. These are only some of the words starting with letter R that we had fun with this week! For some reason the letter R week was more fun and more packed-full than other weeks, or at least, we tend to do more things that start with letter R naturally around here! 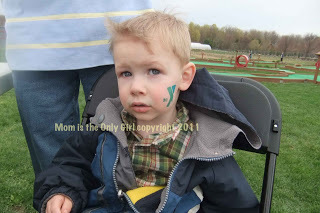 Gross Motor – Sweet Pea had his second gymnastics class this week. He got to fly on the harness! He loved it to say the least! He also did a lot of Rolling – both himself and balls! Plus, he got to swing on the Rings! This class is definitely right up his alley! Of course, Cutie Pie has been Rolling around at home, too, since Sweet Pea comes home and tries to do front Rolls in the living room! And they both get to Running around our loop like crazy at night! 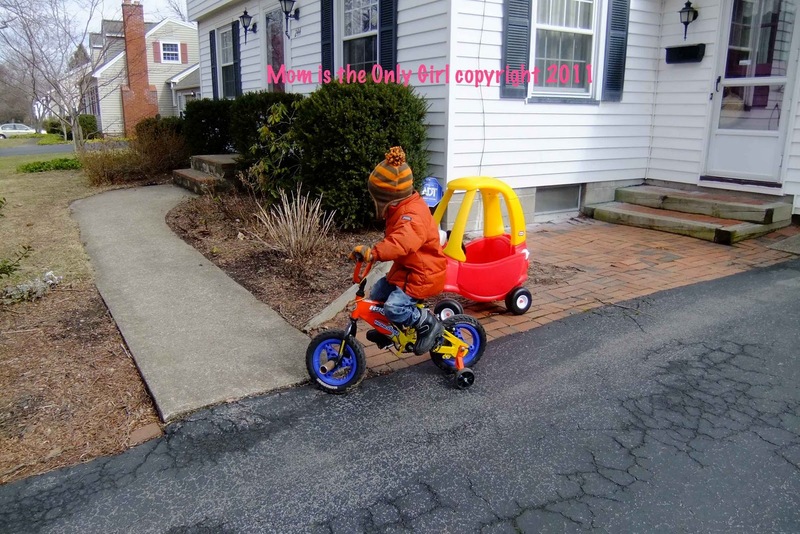 Meanwhile Cutie Pie asked to have his bike out on one of the warmer days to Ride it in our driveway! He did great! 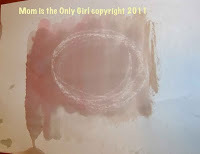 Science – I did manage to do a science experiment with Cutie Pie one day while Sweet Pea was napping. As with all experiments, you never know if they will turn out as you expect. This was no different! We tried to make Rock candy. I found this neat science experiment site called Science Bob, and on it they had directions for this edible experiment, watching sugar crystals grow. One key step in this experiment is to add the sugar very slowly to the boiling water and stir until completely dissolved. Cutie Pie was not very patient, so our rock crystals grew overnight into a solid mass of diluted sugar with water on top in our jar. Cutie Pie was disappointed it didn’t work, but we re-read the directions for the experiment and he decided we should follow them more closely when we try it again! I had a little R experience myself – a Reunion with family I have not seen in many years! Truly exciting and something I will write about at a later date! 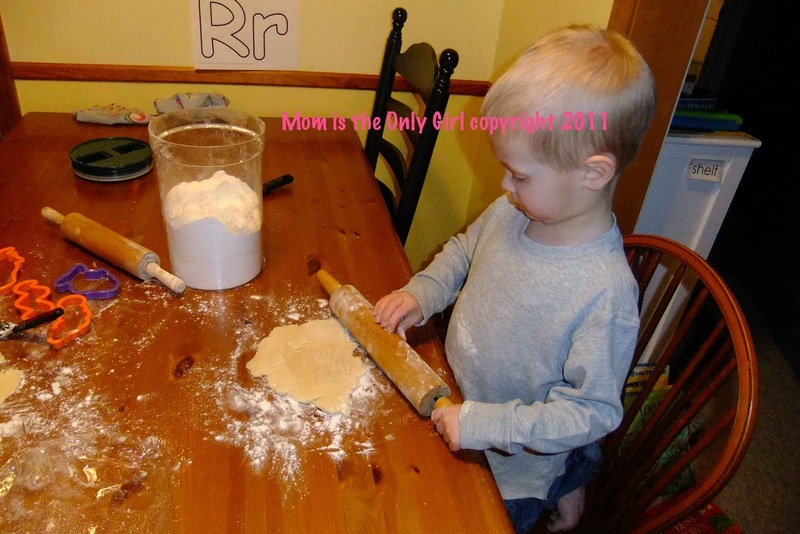 For other links to R activities, check out The Attached Mama and her resources from various blogs! 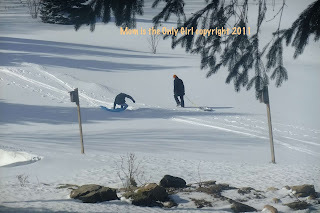 So I mentioned earlier this week that we had a lot of snow after a terrific thaw, so I thought I’d share some pics. Not only did we have a lot of snow here, but 2 hours away while we were on our way to see my dad and my mom, and we ended up driving into a blizzard! It made a simple overnight trip quite an adventure! My dad’s house is on a road that runs up the side of a steep hill (remember the photos I posted here from our last trip there?) 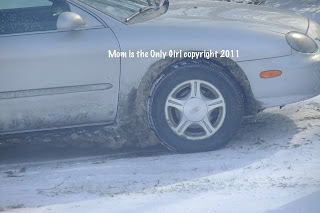 As a kid I remember many days staying home from school because the bus couldn’t make it up the hill, and long, cold walks up the hill in sneakers after school when the plow hadn’t yet made it up the hill and I forgot to wear boots that day. Of course, I also got to ride in a snow plow once when it was arriving to plow the road at the same time the bus was! What an adventure! Growing up there playing in the nature surrounding me and the peace it afforded has offered many wonderful memories! As a kid my dad and neighbor built wooden ramps and a toboggan run down our back hill. The new neighbor made an awesome snow ramp for us! 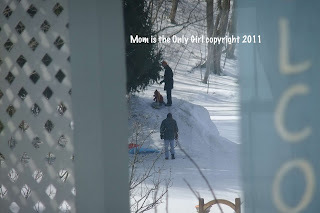 Grampa and Hubby trying to convince Cutie Pie how much fun sledding down a huge hill can be…they only went 1/4 of the way down, and Cutie Pie was not convinced! Back at home, following animal tracks. Poor Cutie Pie could hardly walk the snow was so deep, but enjoyed every minute of it! Loves his science! 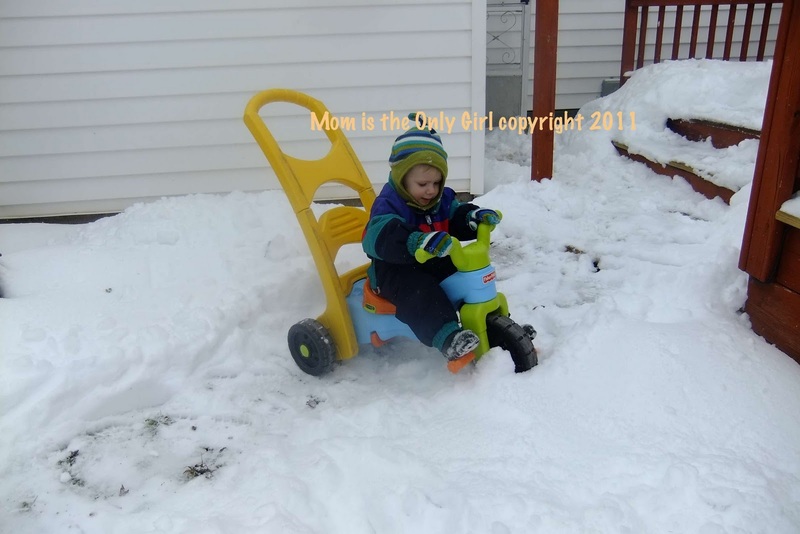 Sweet Pea saw his bike and was convinced he could ride it outside in the snow. He was wrong. Pizza, Pancakes, homemade Pretzels, Prehistoric animals, Pulled Pork, Pasta, Pepper, Please, Papa, Plants, Pom-Pom, Play (lots of it!) – This pretty much sums up the week around here! Not enough? Then include the Bible story about the wise and foolish builders and we’ve got you covered! Language Arts – In addition to Sweet Pea getting really into pasting Purple and Pink Pom-Poms on our large letter P, Cutie Pie has started to sound out simple words and through a lot of fun making up silly words with his Daddy, he’s starting to rhyme words when given a letter to start the rhyming word with. (Think “what rhymes with duck that starts with a P?”) I know this sounds simple to us, but it isn’t always that easy for kiddos! Math/Science – Cutie Pie really got into the “What is” game with me, at least that’s what we’re calling it! It’s pretty simple. 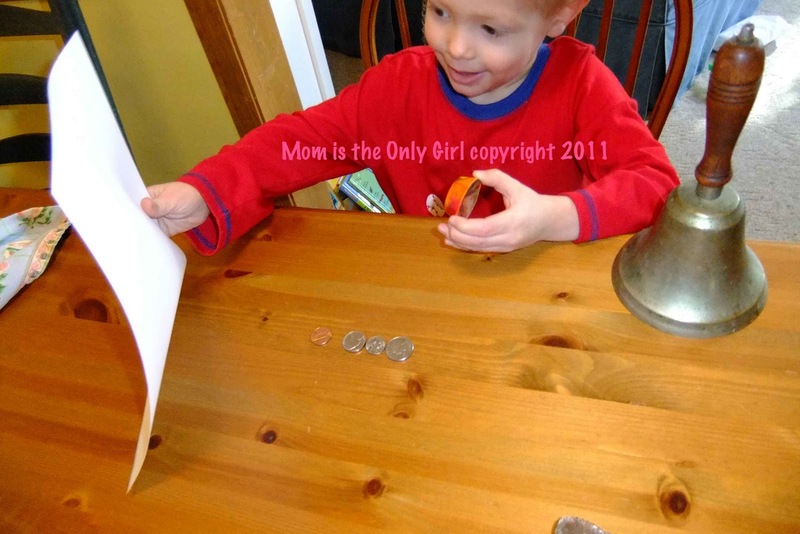 Take two objects and compare them, asking your child for the answer. For example, “what is bigger Daddy’s foot or Mommy’s car?” I tried this with things that are still abstract to him, like comparing a whale to a sky scraper. He absolutely loved this game! 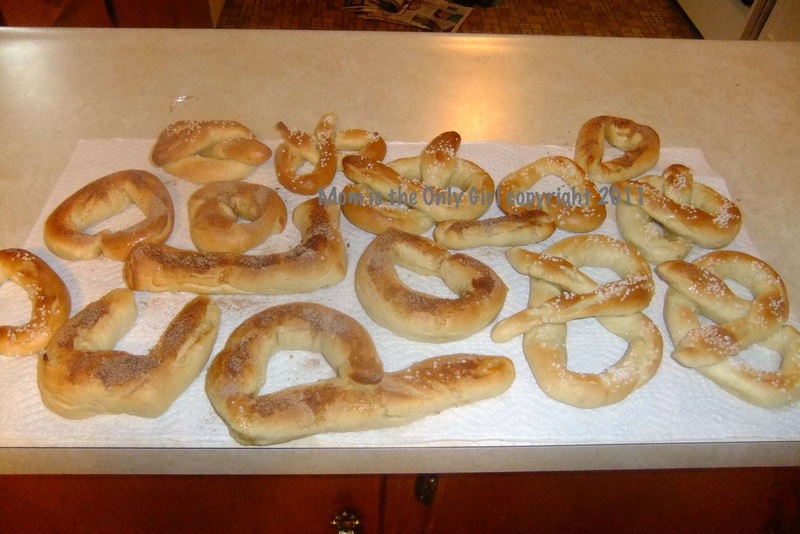 We also made homemade pretzels. The boys didn’t get into it as much as we thought, but they were delicious! Play – As I mentioned earlier we visited my dad for an overnight. My kiddos love their grampa! They had a lot of fun playing with him. They also got to see my mom, whom they always have a fun time with! At her house they seemed to like Pushing around her stools, but she also has some Megablocks and they built some tall towers there! And P week wouldn’t be complete without getting to Play with Papa! Now, to think of fun things to do with the letter Q….. Happy Valentine’s Day! We’re going to spend the day making something sweet for Hubby and enjoying each other’s company while having a lot of fun together. Then when Hubby gets home we’ll shower him with love! Science – The kids seemed fascinated by Jonah being swallowed up by a big fish. We talked a lot about this story through the week, wondering what he felt like in the whale’s belly, what else was in there with him, what it might have smelled or felt like, whether it was light or dark, if other things in there were Moving around like he might have been. I tried to get the boys to think about it in relation to all of our senses. It was pretty entertaining trying to see this story from a child’s perspective! We enjoyed fun snack bags containing fish crackers, raisins (we pretended they were sea urchins), letter pretzels (which, according to Cutie Pie, were “some other things found in the water”) and then added a picture of Jonah to the bag. We used a twist tie and twisted the bag shut to make it look like a fish. When it was snack time they opened them up and let Jonah out through the whale’s Mouth! I wasn’t sure the boys would enjoy or appreciate this, but they loved it! Language arts: We read The Cow Who Clucked , by Denise Fleming, and talked a lot about the M sound and words beginning with M.
Math and Science – The kiddos enjoyed sorting M&Ms, items on the table, pieces of clothing from laundry to fold pile. I briefly introduced the idea of believers and non-believers to them as the story of Jonah leant itself to talking a bit about this topic. Most often, we pretended the Thomas indoor play tent was a whale and the couch was the boat we were on. Cutie Pie insisted we had to crawl into the tent really fast and move around in there a lot and pretend it was dark, but, according to him, it was dry in there because bellies aren’t wet on the inside. After a while we were ‘spit out’ Thomas’s door and suddenly we were sunbathing and playing with dump trucks in the sand! It wasn’t exactly how the story is told in the Bible, but I think from the other conversations we had throughout the week, that Cutie Pie knows the story! And on Friday we made our Valentines for family. Just something simple that Cutie Pie could make on his own, although Sweet Pea did help do a little stamping! We went to an Orkidstra concert on Sunday and were able to see the boys’ cousins, so it was really important to Cutie Pie to make actual Valentines this year to give to them! Last week we concentrated on the letter L. I started posting a giant letter of the week next to where Cutie Pie sits for meals and he’s taken to tracing them with his finger often and this seems to help him remember the letter names better as we talk about them more often at his prompting. We also talked about the prophet Elijah. Bible Story – Cutie Pie seemed fascinated by the fact that even though everything was soaked with water, God could create fire. Other than this part of the story of Elijah, Cutie Pie was not interested in learning about him. Language Arts – We talked about a whole lot of words that start with the letter L. Lions, Lambs, Lollipops, Laying down, Little (and big – science) and just about every other word beginning with L, too. Cutie Pie has a hard time saying this letter, which I think is typical for a lot of 4 year olds, so we spent a lot of time saying words starting with L or containing L.
Science – Lion chow was on the snack menu again this week (see here for last week’s Bible story and related recipe). The boys loved it, and it was great measuring practice! 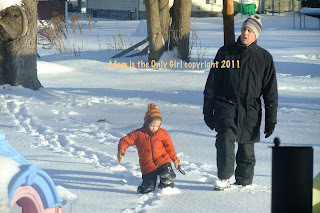 We also spent a lot of time pretending to be lions…eating what lions eat, walking like lions, huddled like lions in lion dens made from sheets and couch pillows…and Hubby spent a lot of time being a lion on his snow day, too! It seemed like we did a lot now that it’s written down, but at the time it seemed like we spent a lot of time being sick with colds this week and preparing for a terrible storm that, thankfully, never hit this area as badly as predicted. At some point I will manage to get pics from during the week from the main computer to this little one each week. Sweet Pea finally joined us at the mastodon dig site at Rochester Museum and Science Center! As a safety rule no one can dig unless they wear their goggles. Sweet Pea has gone in to dig before, however has always quickly removed his goggles and has had to get out. I was so excited this past visit when he actually kept them on and could dig with us! And he really liked it! Sweet Pea really got into it uncovering ‘dinosaur’ fossils. 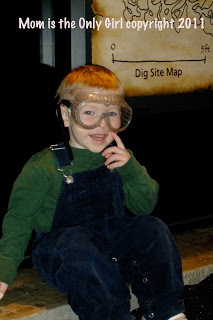 (Yes, I know it’s a mastodon dig site, but Cutie Pie is so into dinosaurs we just call it digging for dinosaur fossils.) Whenever Cutie Pie would say he found a bone Sweet Pea would immediately go over and help uncover the discovery, with a very serious face! He knew this was important work! He also got very excited when he saw the dinosaur bones on the video playing above the dig area. It was as if something clicked in his little brain! I’ve said it before, and I’ll keep saying it: I love it when I can clearly see my kiddos are learning! So if you have these items and want a quick and neat experiment to do go check it out at A little learning for two! My boys loved seeing the water come spurting out of the bottle like a forceful volcano! And they got a chuckle out of it spurting all over me the first time when my finger slipped off the hole! Place the funnel into the empty bottle and pour in some water. What happens? Pack clay or play dough around the funnel and neck of the bottle, making sure there are no leaks. Pour water into the funnel to fill it up. What happens now? What to look for (directly from the book): Does the water enter the bottle while the clay is in place? Is the bottle really empty? How do you know? Does the water flow into the bottle when you remove the clay? How can you explain the difference? Impulse purchases at a museum gift shop are usually not the best thing to do. However, this impulse purchase ended up being a total splurge without realizing it! Cutie Pie wanted to visit the museum store simply because on our last visit he went in with Nana because she had to buy a gift for a friend and he saw a robotic dinosaur skeleton. So, naturally to him, we were supposed to go in again on this visit. I knew better, but we went in. I spied this small dinosaur excavation kit for $3 and thought what do I have to lose other than that it’s for 7+ and Cutie Pie is only 4? Let me say it was not the easiest dinosaur skeleton to put together. I would imagine it would be hard even for a 7 year old, as the pieces fit together very loosely and kept falling apart. However, it turned out looking pretty neat after I glued it and a plus is that it glows in the dark and Cutie Pie is in to that lately! I’d say for a budding paleontologist, this was the best $3 I could have spent! 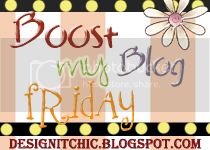 Now hop on over to We Play at Childhood 101 and see what others have been up to! Last week seems like a blur to me, so I’m thankful I had the foresight to scribble notes about what we did! We concentrated on the letter J and David bringing the ark of the covenant to Jerusalem. The boys learned a new song, “I’ve got the Joy down in my heart” and Sweet Pea took to it pretty quickly. We also visited a couple more preschools, one visit inspiring an experiment at home! 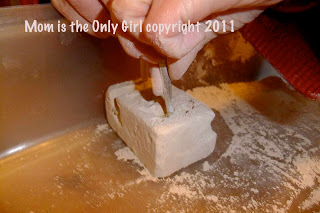 First get out some plastic butter containers, plastic grocery bags, rubber bands, rice, a pot lid and a wooden spoon. Take butter containers and placed the grocery bags over them, and put the rubber band around them so they were very flat and tight like a drum. Place a few pieces of rice on the drum. Then yelled really loudly and watched the rice. Does it move? It didn’t move for us. Next hit the pot lid with the wooden spoon a few feet from the drum. Does the rice moved just a little? Take turns hitting the pot lid with the wooden spoon, this time as close to the drum as you can. We watched the rice jump and shimmy around! Sing a few notes next to the drum. What happens? We found that certain notes made the rice move, too! Experiment #2 – The preschool we visited for circle time was all set up for a citrus tasting experiment which the children were going to participate in when we left. Cutie Pie really wanted to be part of it, but the preschool said it was just for their students. 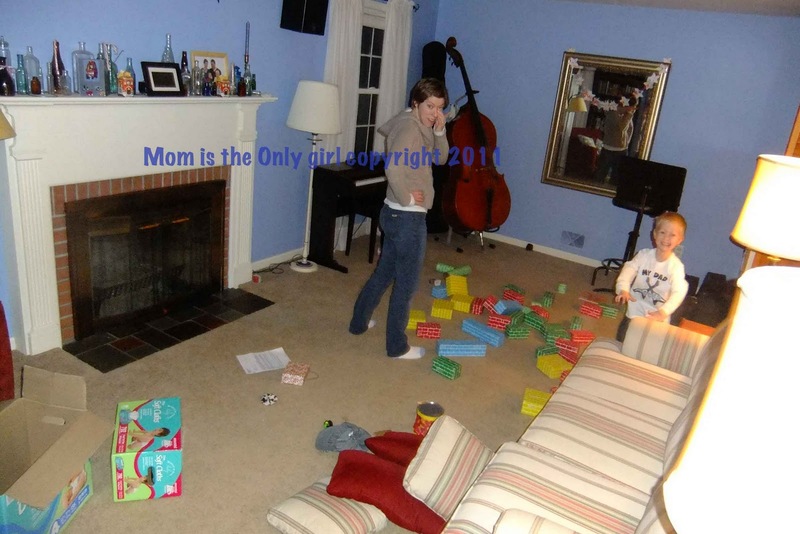 What’s a mom to do when her boy wants to do an experiment so badly? We headed to the store (well, we were on our way there anyway) and picked up an orange, tangerine, lemon, grapefruit, and lime. Unfortunately that’s all we could find on this particular day – I had expected to find more, but we made due. We took the other half of the fruit still in it’s peel and each boy mashed it on a hand-held juicer. They boys kept requesting more sugar or water until it tasted good to them. 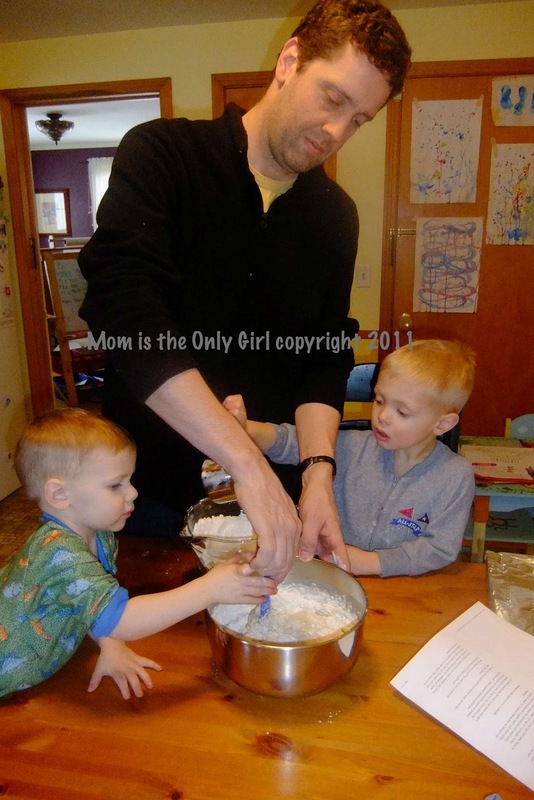 (sense of taste, fine motor, and we didn’t make it too sweet!) There is nothing like homemade Juice during J week! And how could I forget that we made and enjoyed Jello Jigglers! It was very cold out last week, even colder today (5 degrees) so I was very thankful for the open gym our community center offers. However, here at home we did a lot of Jumping! It was a fun week, now that I sit and remember it! Sorry I didn’t post this on Monday as I had intended. It was a rough week and busy weekend and left my mind numb! Last week we concentrated on the letter I and the David and Goliath Bible story. This was a fun letter, because it is the first letter in our last name. However, with all the other things going on during the week we didn’t do as much as I’d hoped. We tried an invisible ink experiment, using q-tips and drawing with them after dipping them in lemon juice (fine motor), then holding them up to a heat source. The lemon juice is supposed to turn brown as it is heated, but for some reason this didn’t work for us. Cutie Pie didn’t seem very interested in this experiment, though, probably because it took time for the lemon juice to dry, so his attention waned. 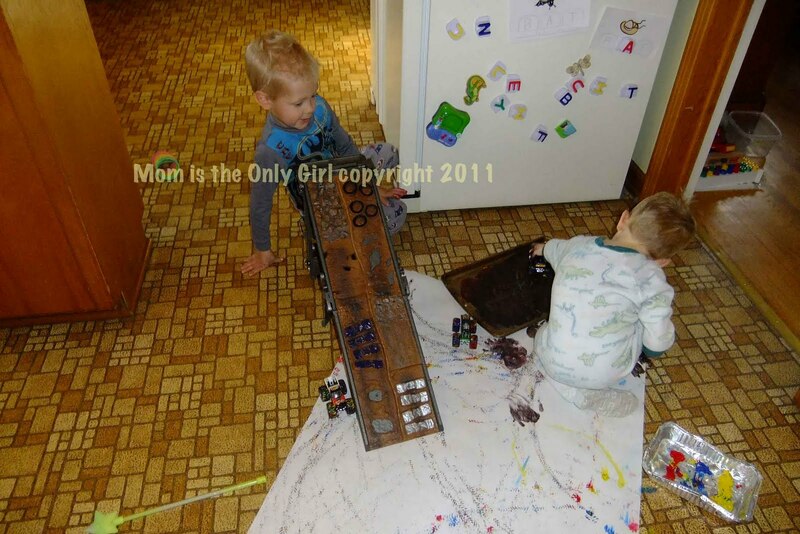 Play – The boys loved playing with inclines so much last week that they kept playing with them this week! Cutie Pie spent a little of his birthday money on a monster truck hill track and has been having fun with his new dedicated ‘monster truck incline’! As you can tell, we’re still doing a lot of experiments. 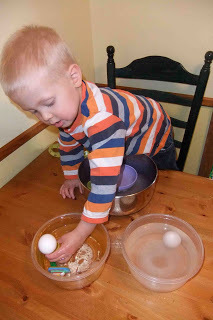 Check out yesterday’s post and offer a comment and you may get your own science experiment e-book as a resource to use with your little one! Science Experiment E-book review and Giveaway! 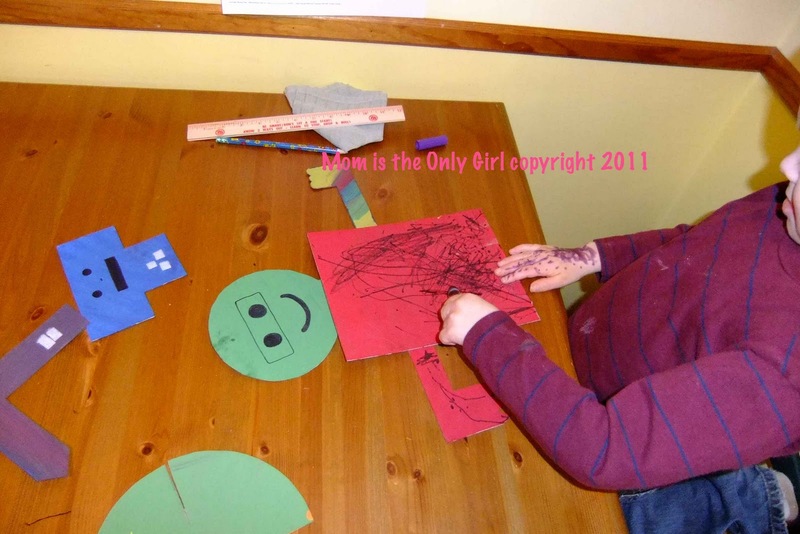 Touch of Home Learning has a new E-book out and I was able to review it! It’s called 60 Quick and Easy Science Experiments Using Everyday Items. I was so excited to receive it and looked through it immediately! 60 Quick and Easy Science Experiments Using Everyday Items is geared to the 3 to 7 audience, probably in a school setting, and I think that’s a pretty appropriate age-range, but I think it worked great doing the experiments at home with my kiddos! It’s packed with practical experiments to do with this age group, many with materials you probably have on hand and others that, with a little foresight, can be purchased easily. The e-book is organized simply into categories with several experiments in each category. Each experiment can be a lesson in itself or, if all the experiments are completed in succession (which may take about an hour) the greater scientific idea can easily be learned. The experiments themselves are explained clearly with outcomes worded in such a way that preschoolers (and parents) will readily understand what they are to see as a result and learn from conducting the experiment. Cutie Pie was immediately intrigued with the experiments in this book. He loved all the experiments we tried so much, that one day in about 45 minutes we completed four experiments and each was simple enough to pull off without any (or much) preparation. He loved it and asked for even more! His favorite experiments were Balloon Rocket, Anti-Gravity Water, and Cup Pulley (well, really all of the experiments in the Big Trucks-Simple Machines.) We even received this book in time to incorporate some of the experiments into our lesson about Humpty Dumpty! I would really recommend this book to those who want to try simple experiments with their kiddos at home, just to see if their child would be interested or whether they have been into experimenting for a while, as well as to those teaching preschool or younger elementary either at home or in a school setting. We still have several more experiments to try, and I can’t wait to try them soon! 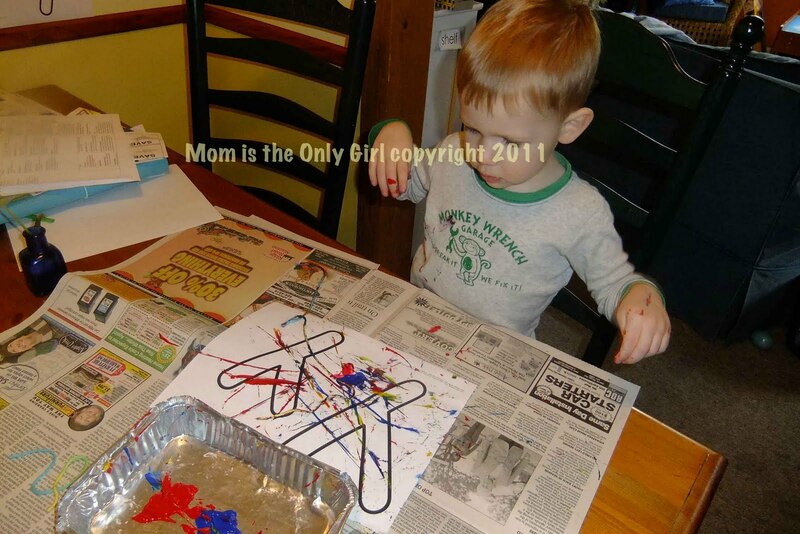 As part of this review, Touch of Home Learning is offering a FREE e-book through Mom is the Only Girl! Comment here and let me know what an experiment you have tried with your kiddos and whether or not it ‘worked’. 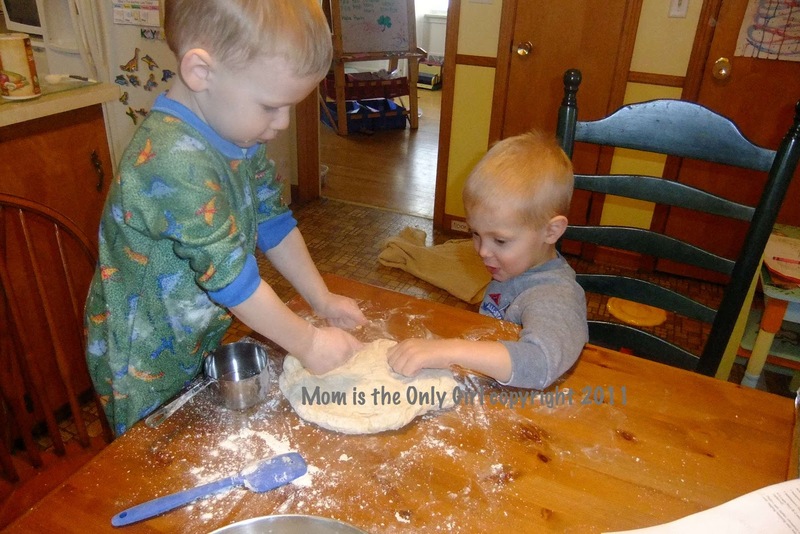 Comment here letting me know you are following Touch of Home Learning for an extra entry. 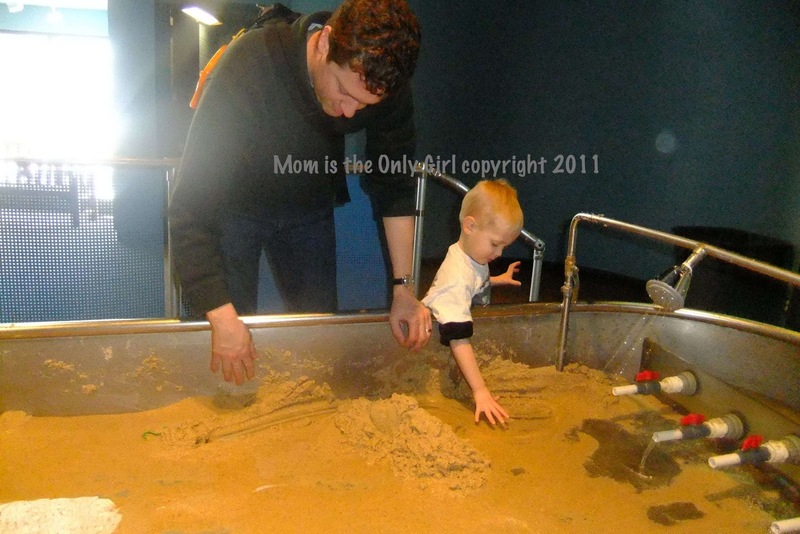 On our most recent visit to Rochester Museum and Science Center we, as always, spent quite a bit of time at the sand and water table. And, as always, the boys used the trowels and shovels to move the sand around, thus creating new paths for the water to flow. However, this time Cutie Pie wanted to make a wall straight across the entire sand and water table to see what would happen and he requested my help! Once the water built up the wall started to fall into the pond and Cutie Pie admitted his hypothesis was correct! I just wish he had shared that with me before we started, because then I would have known I was part of an experiment and the whole experience would have been neater for me! 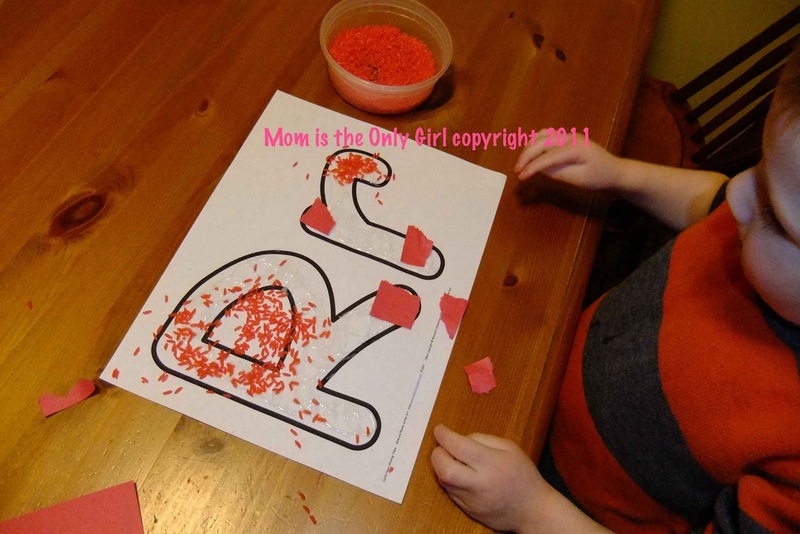 I love that Cutie Pie is learning through play! 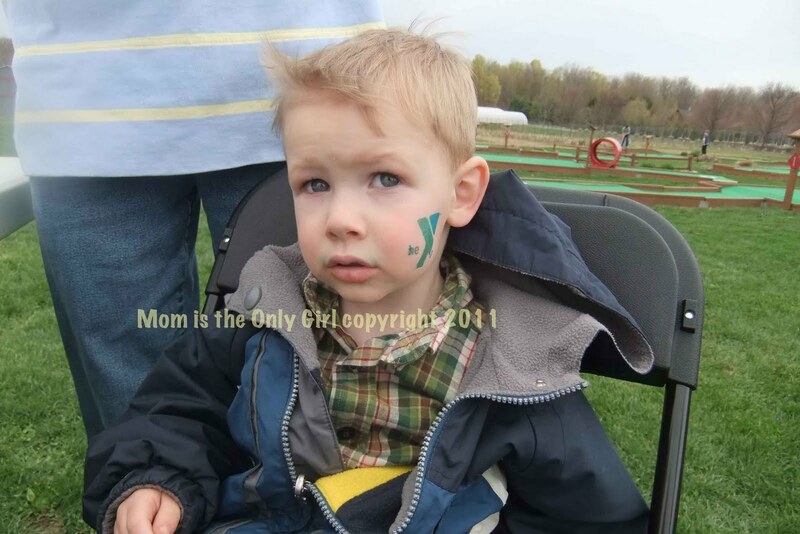 Check out how others are playing at We play Tuesday – Childhood 101! We went to the local science museum again recently. They have a neat area that’s all about beavers and their natural habitat and how humans are affecting it. Of course, for now we concentrate on the animals and feel the pelt and tail and look at the display of a beaver standing outside it’s den with a stick in it’s mouth. Our visits to this area are usually not very long even with the kiddos playing with the hands-on things there. This time, however, we spent a lot of time there. Cutie Pie, in his 4 yr old wisdom, wanted to educate Sweet Pea on being a beaver. They dressed up in the costumes there, hood and all – very cute! Cutie Pie had me calling him Mr. Beaver and gnawed a seat for me out of a log that happened to be there (pretend, of course!) then proceeded to tell us all about his home. Sweet Pea was fascinated with the sticks intertwined above us, seemingly a real beaver’s den. We also spent a lot of time in the puppet area playing with all the animals you’d find in this particular habitat: a turtle, fox, frog, deer, raccoon and beaver. Cutie Pie seemed to know exactly what beavers eat, how they make their dens, that they live in families and have the same ‘wife’ for life! I hadn’t realized how much he’s been learning on our visits there! It seems like whenever I ask Cutie Pie about what he’s learned, even in an open-ended way, he’s on to me, but when I least expect it I discover what’s in his brain! 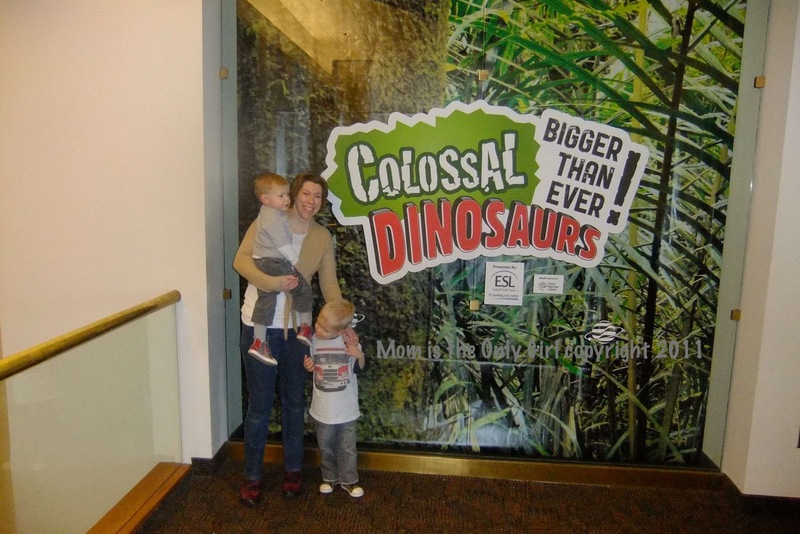 I love taking my boys to the Rochester Museum and Science Center! It seems like every time we go they learn something new, reveal to me they know something I didn’t know they knew, or spend a great deal of time doing something I didn’t know they were interested in! Awesome! This past week we concentrated on the letter H as well as Joshua and the Battle of Jericho. It was a pretty fun week to say the least! We are still having computer issues with our main computer (which houses our photos) but I will try to add photos of this when it’s working again, because I think I got some cute pics this week! Cutie Pie was pretty entertained by the inclined plane, so we found ourselves experimenting with that off and on all week assisted by some experiments in this neat science e-book I am planning on reviewing on this blog next week! Cutie Pie told me the other day that he likes doing experiments with me and wishes he could do them every day. Since his interest is so strong I think I’m going to try hard to do this with him! Just before Christmas we had so much snow. We had decorated the inside already and Cutie Pie asked when we would be decorating outside. That’s when I remembered this neat idea to make ice ornaments to hang on a tree! I had seen this idea in several places, but loved the Lego look of these! This was the perfect project for Cutie Pie and I do do instead of a hot cocoa date! First get out some tins, cupcake tins, empty yogurt containers, anything you’d like to use as a mold for your ornaments. One place I saw large ice wreaths with cranberries inside, made from an angel cake mold. Also have string, yarn, unbent paperclips, or anything else you’d like to use as hangers ready to go. We used unbent paperclips as they seemed easiest to hang over a tree branch because you could adjust the hook. Next, gather some items you might like to place inside the ice, like pine cones, an unbreakable ornament, birdseed, cranberries, if you’d like. Remember, if you are using something that doesn’t melt or food for the animals you’ll have to bring it in later. Fill up your containers with water and add food coloring to create your desired color. 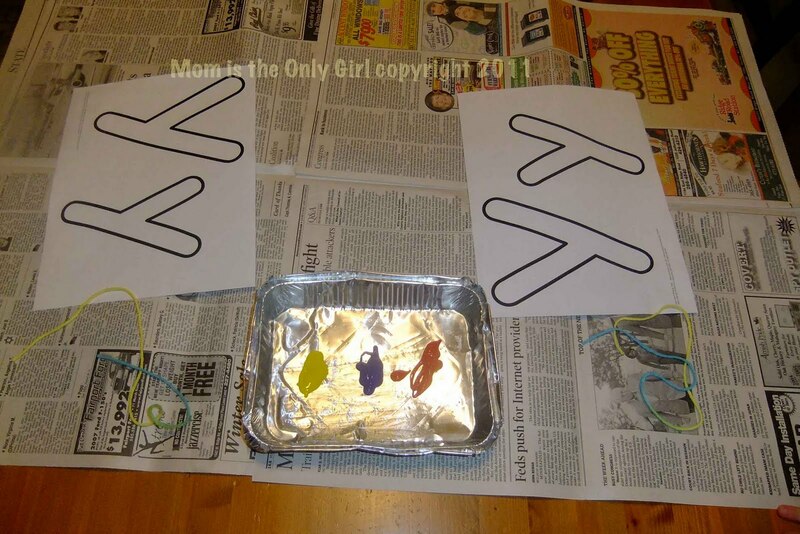 (fine motor, science – colors) We made ours vibrant, or so we thought. Next time we’ll add more coloring and we’ll make a lot more or make bigger ornaments! Add your contents, if any, remembering to add a hanger. Then either set outside on a flat surface (if it is cold enough) or in the freezer to freeze! (science) When everything is frozen remove from the mold and hang outside on a tree or clothesline, anything that needs some color and enjoy! Drum, donkey, Daddy, dinosaurs, donuts, doll, dime….. This past week we talked about the story of Jacob and Esau. I never realized (or thought about) it before, but the story involves all 5 senses. So, we spent the week talking about our 5 senses! Unfortunately, the kiddos had colds, so we didn’t really do anything fun with the sense of taste or smell, but hopefully we will when their noses stop running. We did do a lot of listening and guessing about what noises we heard. The boys loved that and keep stopping me even this week when we are out and about saying “Mommy, listen. 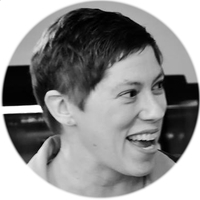 What do you hear?” We also touched a lot of things and talked about hot, cold, soft, furry, scratchy, bumpy as well as how some things can involve more than one sense. We concentrated a little more on the sense of sound, as that’s where the boys seemed to have the most fun. They entertained themselves often with parades playing their instruments, humming, singing, more humming and some screeching mixed in. The other garden we planted in May: our vegetable garden, and yes, I am painfully aware this post was left out way back then, so here it is now with a recent photo so you can see our progress. Cutie Pie was a good helper to Hubby who plants a salsa garden every year. This year was the first year Cutie Pie was interested. 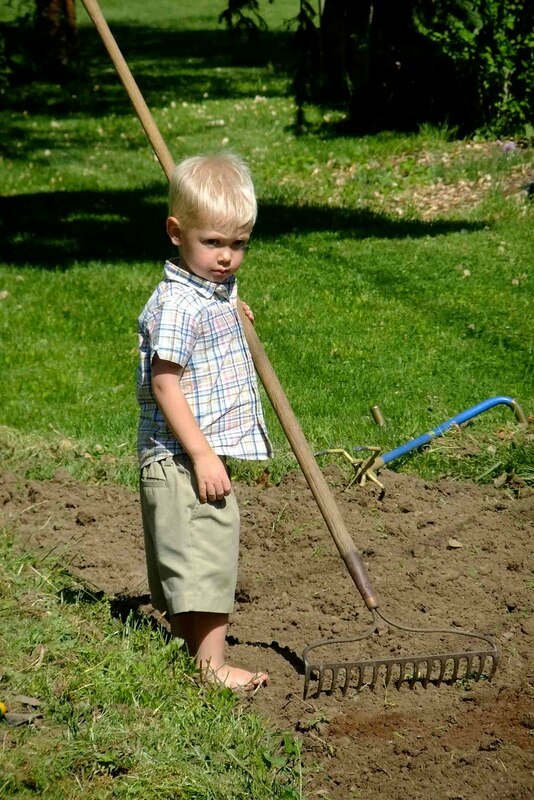 Above he is pictured raking the garden just before the peat moss was added. 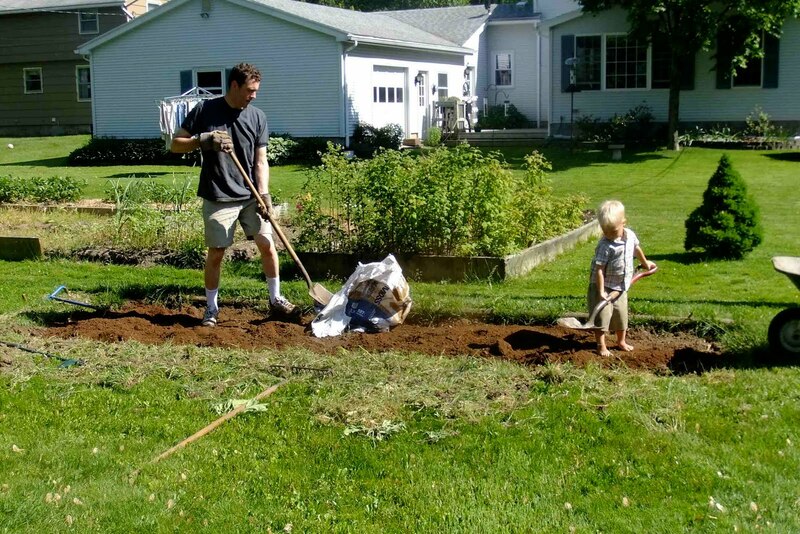 Here he is helping Hubby mix the peat moss into the soil to make a good base for the tomato plants and the two types of peppers that are now planted there. 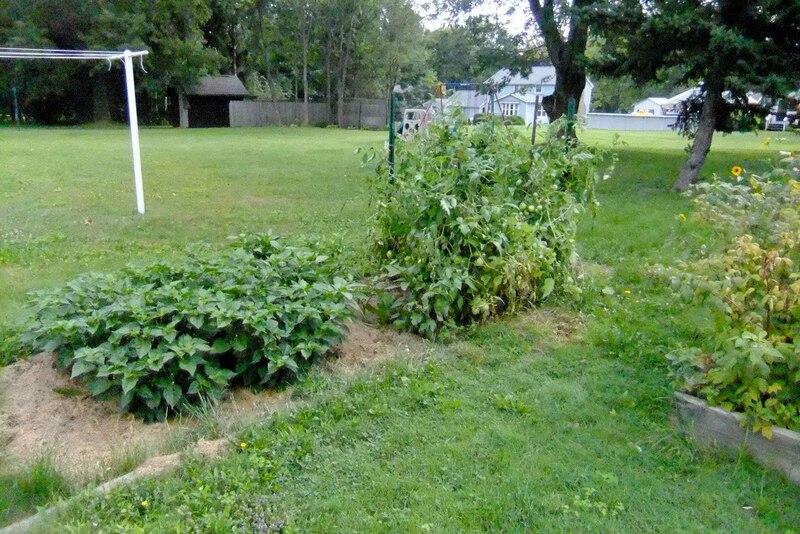 Of course, our garden dwarfs in comparison to our neighbors, which you can see in the background, although she does grow different crops and has been teaching our boys all about sharing – she had delicious strawberries this year and her raspberries were scrumptious! And here’s our veggie garden now! 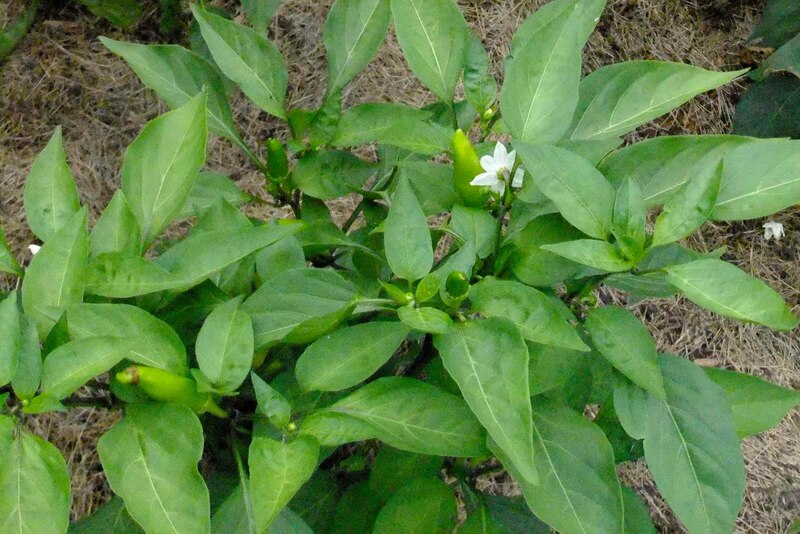 With help of grass clippings for mulch, the plants have really blossomed! Cutie Pie’s proud he helped create this and loves the homemade salsa – another lesson in patience! We like to go to the local museum and science center quite frequently. The most recent time we went I decided I would make the kiddos stop running from the water and sand area to the mastodon area and actually look at the Kaleidoscope they have off to the side in their main foyer. I’m so glad I did – what a treat! The pic above is actually where you look into it, the eye hole is rather large, don’t you think? This is what it looks like when you are looking into it. You can’t see it in the photo this size, but Sweet Pea is looking in the other end at the camera. Isn’t it neat? The color here doesn’t do it justice. This is the end you are actually looking at, although this is the outside, looking into the tunnel, if you know what I mean. Sweet Pea and I switched places. If you look closely in the center at the circle you can see him peering back! At first neither Cutie Pie or Sweet Pea were interested in this, but once I held them up to peer through they loved it! Sweet Pea doesn’t know enough words yet to say what he thought, but by his facial expression and the way he was running from one end to the other you could tell he was fascinated by it. Cutie Pie loved it, too, and was questioning what made the colors and patterns he could see. Once he saw the slivers of stone he thought the whole thing was pretty neat! I can’t wait for his interest in the stones to deepen! 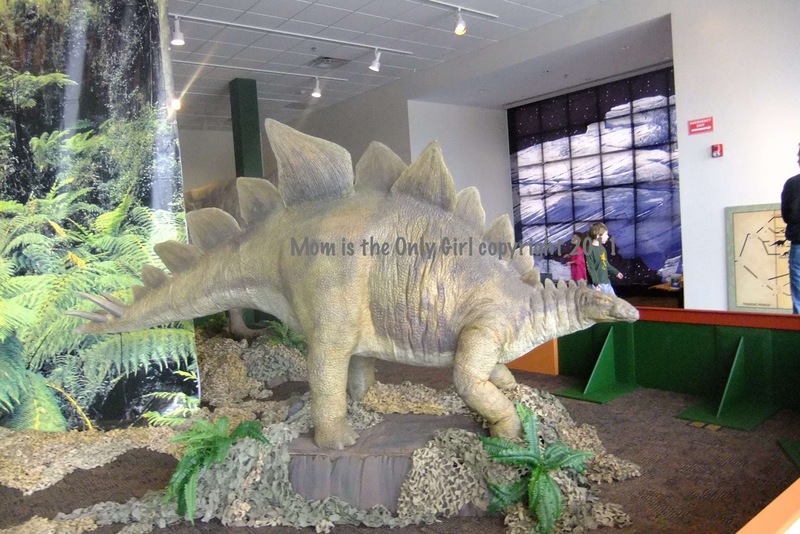 I love this place…so many neat little things to draw the kiddos’ attention to on each visit. And on each visit, when it seems there is nothing new for them to be interested in, I realize they are just old enough to be interested in yet another thing that has been there all along! How cool to have a science experience just drop in our driveway…literally! I was pulling our driveway safety net out so the kids could play and I saw a cicada shedding its shell! Very cool especially because we had just watched a video about insects a couple of days ago and learned about how some insects grow this way. I tried to capture it in pictures, but they don’t do the experience justice. Now, I’m assuming this is a cicada because I’ve never seen one before, but they are huge, and look like the pictures I’ve seen although this guys’ head was wide and in the pics I’ve seen their heads were narrower. The cicada shell was attached to the net as if a foot was still holding on. The cicada was very light green and we could see the first two legs and it’s enormous head and beady black eyes. After a few minutes we could see green fuzzy things on either side of it’s big body and a few more legs. On the video we learned their bodies swell up after emerging from the shell and this was definitely true in this case! After a long time, actually only about 15 minutes or so, but long enough for Cutie Pie to say “I’m done with this now, Mommy” all but it’s tail had made it out of the shell and it was very clear how much bigger the cicada was now as it’s shell was just about empty and was only maybe half as big. (See picture above.) After a bit more it was all the way out of it’s shell. About this time Sweet Pea wanted to investigate ‘hands-on’ so Hubby gently moved the cicada to a tree by enticing it to grab onto a stick, where it seemed to be resting. We kept the shell so Cutie Pie could see it up close and touch it. The green fuzzy things were unraveling and clearly were it’s wings. Also, it was becoming darker in color, just about all brown, now, which the video said happens when the new shell hardens. Cutie Pie did run over to check it out here and there after, just didn’t want to stand and watch like me. Below is the last pic I took of it. It’s wings were all straightened out and every once in a while a leg would move or a wing would twitch. A few hours later the cicada was gone. Very cool experience. I’m sure the people walking and driving by, as well as the men removing trees across the street, were wondering why we kept staring at the safety net and the tree, but it was such a cool experience I didn’t care! I just realized I totally forgot about our Memorial Day weekend full of gardening! Last year Cutie Pie and I had transplanted some hostas to a nice spot in need of love on our property and harvested the seeds after they flowered. Earlier this spring we planted the seeds in little pots, kept inside, and Cutie Pie kept them in the sun and watered them and we watched them sprout and get bigger. Finally when it was warm enough, which around here means Memorial Day weekend, we decided to transplant them into their permanent home in the corner! 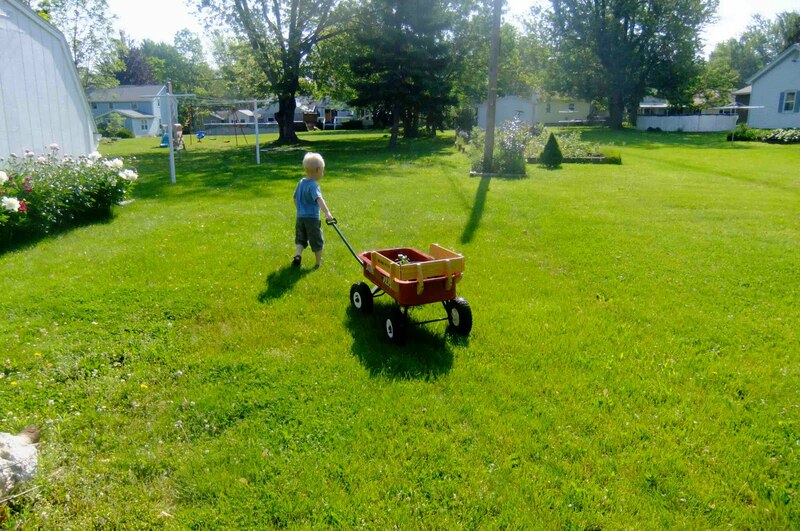 Cutie Pie was a great helper, taking the little hosta plants to their new home in our wagon, then helping dig the holes…he was so excited! The next day, Nana came over and planted some more plants in our corner. She is a great gardener and this year had lots of plants she was cutting back, so she brought some over to us! Cutie Pie was out helping her, too. He loves spending time with her and I’m sure she was delighted doing this with him! We check on our little hostas every other day or so. Of the eighteen we planted ten have survived! I’m excited about this because I’m not really that much of a gardener – if something is already planted and living I can keep it alive, but growing from seed never seems to work for me. I’m also excited about this because it’s something I’m doing with Cutie Pie that will hopefully culminate in something he can actually see grow and so far he’s stayed interested, even though growing is a long process! Sometimes he asks to water the plants, with help from Sweet Pea! I will try to remember and post a photo at the end of summer when our plants should be bigger and look more impressive! I found this magnet kit a few months ago. Every once in a while I’ll get it out with Cutie Pie. The other day he wasn’t feeling too hot, so we got it out again. He always has so much fun with it! This particular day all he wanted to do was ‘go fishing’. The kit came with plastic fish, paper clips, these little boxes that you can fit wheels to or make into a boat, some round magnets, rectangular magnets and a couple of posts and sails. We of course, couldn’t go fishing without having a boat in the water! Cutie Pie had great fun fishing with his magnet hanging from his ‘fishing pole’ and counted the fish as he caught them! (There were 10, he counted to 7 correctly! This was his idea!) His coordination improved more and more as he played! We also used a rectangular magnet in the boat as well as under the table…to make the boat ‘go’! These are pretty strong magnets to work through an inch of wood! We talked about why the magnets moved away from each other to make the boat go, as well as why they attracted the paper clips. At one point he said “they are together like a train!” in relation to his magnets sticking together. Quite often when we play with his trains, which have magnets, Cutie Pie will call out ‘reverse the polarity!’ and turn his train car around so it will hook up to the next in line rather than push it away. We talked about how those are held together or pushed apart by magnets and how the ones we were playing with were the same thing, just not attached to his trains. We had to get out of the house today. We decided since it was icky out we’d go to the pet store, a place Cutie Pie loves to visit, but doesn’t get to very often. Today the hamsters were very active, so were the birds. We talked about what they were eating, where they might have thought they were going while running on the wheel and flying in and out of their nests. Cutie Pie had some great answers and reasons why! I asked Sweet Pea what the hamsters were eating and he said “Rocks”. Cutie Pie saw that they were eating corn kernels and we observed how they were eating them with their little pink toes, which were really pretty cute! We also looked at the hermit crabs, which fascinated Cutie Pie as one of the videos we borrowed from the local library talked about crabs and their shells. Cutie Pie did a great job ‘educating’ me about how hermit crabs change shells as they grow, just like he learned in the video. He is such a retainer of information! We went to the library last week and found this neat book of experiments called Big Book of Play and Find Out Science Projects Easy Activities for Young Children by Janice VanCleave. I was browsing through it when we got home and saw an experiment called ‘Why do Boats Float?’ in the Forces section and thought Cutie Pie seemed to be in a good mood, so why not try an experiment with him?! The funny thing is, we tried this experiment last week as described below and in the pics and since then have seen something similar on No Time for Flashcards as an idea. It was rainy and on our way in from the library the boys splashed in THE PUDDLE that always seems to form between the car and the house. When I glanced through the Big Book this idea caught my eye simply because we had talked about how we sink whenever we splash in that puddle. 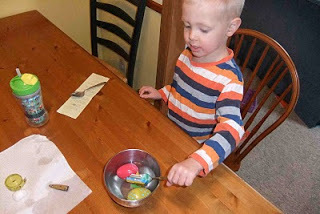 I waited until after lunchtime, and then got out the bowls, playdough (we didn’t have modeling clay) and gathered some items to see if they could float. This, of course, caught the boys’ attention. After talking about why the ball of playdough sank and the boat shape we made out of the same ball of playdough floated, Cutie Pie helped plunge items into the water to see if they would float. I figured a cotton ball would float, but would get water-logged and end up sinking and quickly looked around to see what we could place it in to keep it dry. I saw the plastic Easter eggs and decided to put tape over the holes and place the cotton ball in one. This was great because it reinforced the idea of the boat floating. After seeing that it floated, Cutie Pie directly took the cotton ball out and plunked it in the water and helped it sink! Then we decided to test some slightly heavier objects to see if they would float in the egg, but sink on their own. As a final step we took two bowls of the same amount of water. To one we added about 8 tbs of salt, the other was left alone. We took an egg and placed it in the first and it sunk (in the pic above he has 2 eggs – he had to have one of his own!) We placed it in the saltwater and it floated. We then talked about how the salt helped the egg float. I think this was a bit over Cutie Pie’s head, but he was right there trying it with me and I think he was trying to follow it all! He definitely had a good time, and both he and Sweet Pea ended up with wet sleeves, but it was worth it! I discovered Cutie Pie does like hands-on learning, but more from an experimental aspect than just doing. Maybe I will try to revisit some hands-on things we’ve tried in the past and concentrate more on talking about what we’re discovering rather than the process of discovering it.